Fall of Nineveh (612 B.C.) - For centuries, the Assyrian Empire intimidated its neighbors through warfare and cruel punishment. Whether or not they were as harsh as their reputation made them out to be is uncertain. Some argue their cruelty is overstated. However, there is a monument that was discovered with an inscription by Ashurnasirpal II (883 - 859 B.C.) that reads, "Their men, young and old, I took as prisoners. Of them, I cut off the feet and hands; of others I cut off the noses, ears and lips; of the young men's ears I made a heap; of the old men's heads I made a minaret." Clearly, there was some savagery there. One of the problems with ruling in this manner is that your enemies are not likely to forget how they were treated. And this was evident when the once mighty Assyrian Empire came to a violent end in 612 B.C.. It's capital, Nineveh, was attacked by a coalition of six kingdoms; Medes and Persians, Chaldeans and Babylonians, and Scythians and Cimmereans. This coalition was led by two monarchs, Nabopolassar of Babylon and Cyaxares of the Medes. Our knowledge of this battle comes from multiple sources. Assyrian records cease with the reign of Ashurbanipal, but the Babylonians chronicled the event (history is written by the victors). The Egyptians who were also hostile to Assyria reference the attack, and Herodotus mentions it over a century later. In addition, the Book of Nahum (one of the minor prophets) deals extensively with the fall of Nineveh. According to Babylonian records, the stage was set in 616 B.C. when Nabopolassar defeated the Assyrians in open battle along the banks of the Euphrates near Harran. This emboldened Assyria's other enemies, and the Medes, under Cyaxares, joined the battle the following year. They took Ashur, a former capital of the empire, in 614. As an interesting side note, according to the Babylonian historian Berossus, the two kings cemented their alliance when Nabopolassar's son, Nebuchadnezzar, married Cyaxares daughter, Amyitis (see the Hanging Gardens). The Assyrians managed to hold off their enemies for another two years, with some success, but by 612, the coalition was closing in. 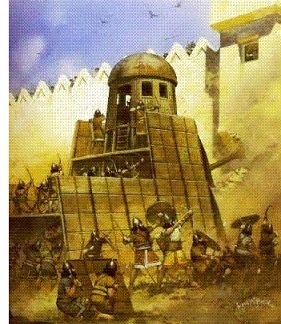 After a three month siege, Nineveh's defenses broke and the city fell. The king, Sin-sar-iskun died (possibly by suicide), but his son, Ashur-uballit II escaped to Harran and made it the new capital. However, it fell to the coalition two years later. Assyria, the most powerful empire on earth, had been defeated. From that point, power shifted back to Babylon after a thousand year absence.